To try and give the animators an easier time, as well as improve the general look of the animated dragon, I have added a flex modifier to the dragon’s ears. This was done by first adding an edit poly layer in which I soft selected the tips of each ear. The flex modifier was added above this and then only affects the sections I had selected in the edit poly. The skinning is finally almost finished, and I am now working on getting the deforms as smooth and natural as possible. One of my biggest problems has been the deformation of the back leg. When the knee twists away from the body, it causes the mesh behind the leg to sink into the body and form a large indent. There are several possible solutions to the problem. The best one would be to create an extra bone linked with the leg that the mesh is skinned to that can be animated to force the mesh back out when the leg twists. However I am already behind on this project and although it would be the neatest and most effective solution, I simply do not have the time available to experiment and get it working properly. As such, I have instead created some simple morphers that can be switched on and off to fix the dent when the leg is brought forwards/twists. Originally I had intended to only need to spend a day or two updating the original dragon mesh from the advanced tech project. However I hit a huge snag when I first started editting involving 3ds Max corrupting any file in which I tried to edit the dragon mesh. Its taken me about a week to track down the problem which seems to have stemmed from using a symmetry modifier, and collapsing it down during advanced tech once it was time to texture and rig. When I then tried to edit again at the beginning of the major project and add a new symmetry modifier Max just couldn’t cope and crashed, corrupting the file in the process. This has unfortunately already pushed me behind schedule and leaves me scrabbling to play catch up. None the less, here is the finished dragon mesh, now with wings and a tidier back (which it did’t have during advanced tech). So it would appear a pair of 3rd year VFX students had their own project idea that involved compositing creature animation into live footage. They actually were aiming for a bit of a “His Dark Materials/Golden Compass” type theme but this still fits well with my original plan to try and composite some of my animation into the streets of Cardiff. However it appears they don’t have quite the numbers of animators/artists (so far at least) required to hit the scale of film they had been planning – which is a shame because it would have been awesome if this had turned out to be the big project of the year. Ho hum. Anyway, it looks like it may just be one 2nd year artists and myself doing the CG side of the work which rather limits the number of creatures they can have. In fact, Paul and I have agreed that we can only manage two creatures. While Paul handles the modelling and texturing, I will be rigging/skinning both models and then creating a walk and run cycle for both as well as a single non-cyclic animation (ie standing up from sitting or something similar). So, that covers 6 of my 12 weeks on the major project. For the other 6 weeks I will be working alongside Elaine and a few others to help produce a short animation we have currently nicknamed “Project: Dragon”. It involves a rather silly chase between a hapless knight and an overly playful dragon. 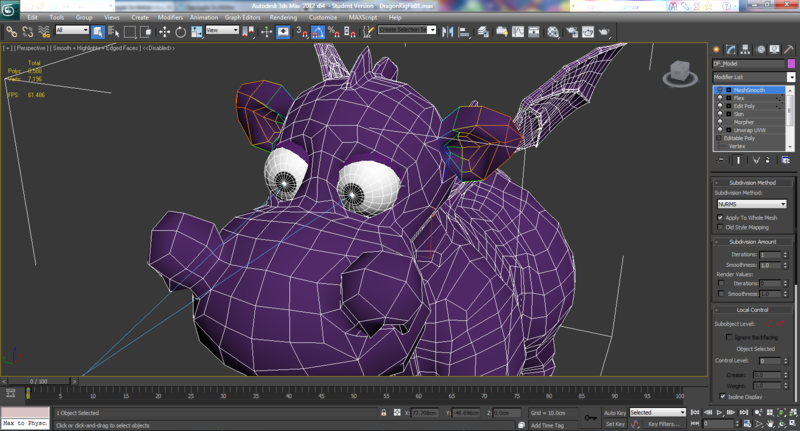 I’ve set myself the rather terrifying project of both modelling and rigging the dragon (eeep!). However, we have an artist who loves to draw who will be doing all the horrible design work of the characters. As such, he will hand me completed turn arounds so I dont have to do any of that nasty stuff involving pencil and paper. Or at least… not in designing the look of the dragon. I still need to work out the rig structure. The modelling of the dragon (and first attempt at rigging) will actually occur during our final advanced tech project. Three weeks to model, texture and rig (a week for each). I will then probably pass the model to Ruth who may tidy up any poor edge loops to aid with skinning the final rig. Jess will also completely re-do my textures. Once that is all complete, I will build a completely new rig, get the model all neatly skinned and set to work creating clever controllers so our animators can have a great (and easy) time of animating him. So that takes up another 3 weeks of major project time. The final 3 weeks will be devoted to doing some animation with the knight in the project – a run cycle, possibly a walk or jog and then some sort of non-cyclic animation. Scarily, we are almost three weeks through our pre-production, and currently I feel as though all I really have is research. Will have to slave away at it all after Christmas. So, I said weeks and weeks ago that I would upload a slightly slower version of the wasp turnaround. Here it is… at long last! Soooo… the trouble with a busy, manic course is that there is no time around the work to actually keep this blog up to date. Looks like I may have to try and set myself a time once a week to sit down and make blog posts. However, since I have found an oppurtunity today, I shall take full advantage of it. The rest of the first two advanced tech course works involved modelling a realistic hand in one week and then rigging, skinning and texturing it the next week. To practice skinning techniques we also had to rig and skin our bug in another 24 hour session. Needless to say, it was a pretty intense couple of weeks. Still, the modelling side of things turned out pretty well. I struggled at first while trying to get my head around the idea of “edge loops”. This basically means keeping the flow of the edges around polys moving nicely around the model and trying to ensure there are as few as possible, so that they actually just loop around and connect in various places. Skinning and rigging the wasp turned out to be a real struggle due to a few mistakes made during my modelling process. As I had modelled the legs quite bent, it was impossible to make them straighten nicely with the rig. Also, thanks to a lack of edges around the leg joints the bends were very untidy. Having completed the wasp, we moved on to rigging and skinning the hand. This went very well and I had it mostly completed on Friday before stumbling across an error. One of my tutors helped me to find a work around for the problem and a way to reload all my work on to the rig after the fix. This worked great on the Friday. However, I came in on Monday expecting only a small amount of skinning left to do only to find that the fix I had been shown on Friday had now deleted all my work and I had to start again from scratch. Unsurprisingly I was absolutely gutted and this seriously affected the quality of my skinning. There were several errors I failed to notice in my rush to get everything complete and I watch my deformvideo now with frustration that the deforms are so much poorer than my first attempt. We also then had to texture the hands. Rather than using photoshop, we used procedural texturing, using various noise algorithms to create the random colour changes etc that you see on skin. Finally, once the hand was rigged we also needed to pick a final pose and animate the hand moving into this pose. So… with the usual throw you in at the deep end attitude that this course has, we were introduced to the basics of modelling within 3ds Max. It was a good lecture, very interesting as I have not really done any modelling (excluding the fruit bowl) within Max. So after a mornings lecture/demonstration of all the important modelling tools we were informed we had 24 hours to model an insect of our choice. Unsurprisingly the artists all coped reasonably well with this deadline, but us animators struggled to get going. None the less I battled on through and just about made the deadline… and then realised I had half an hours worth of rendering to do before I could hand it in. Whoops!! That will teach me to not think of these things earlier! Anyway, I was rather pleased with my model, pretty good for a first attempt I felt. I provide you all with a turnaround to form your own opinions! The turnaround is currently extremely quick as I reduced the frame count somewhat to try and get it to render as fast as possible. When I get a chance in the next few weeks I will re-render it at a slower speed so that you can actually get a proper look before it spins away! !